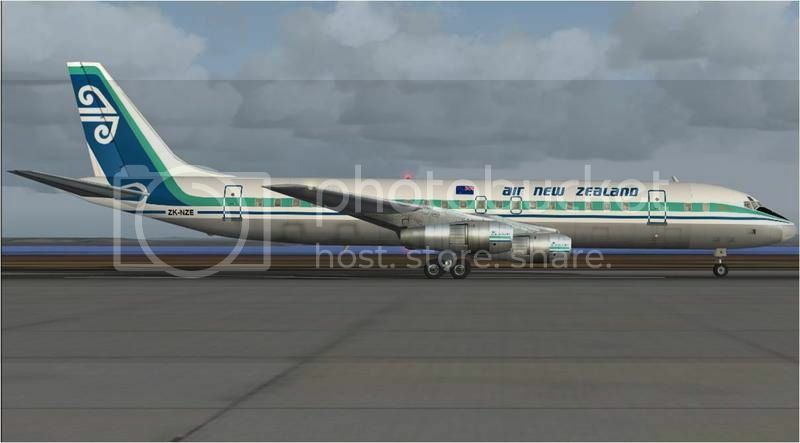 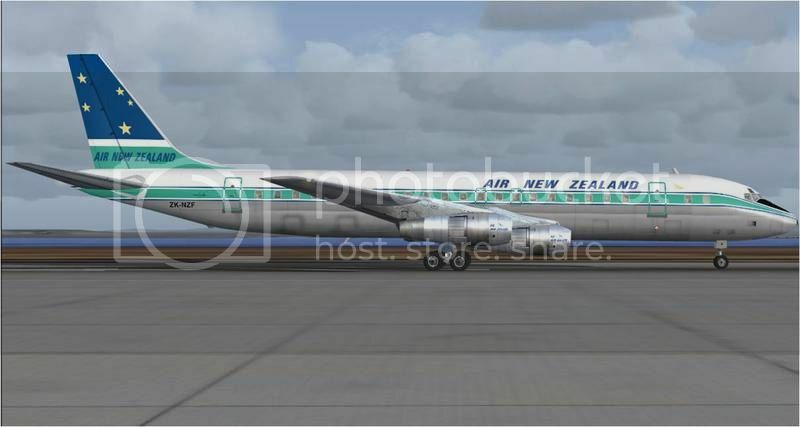 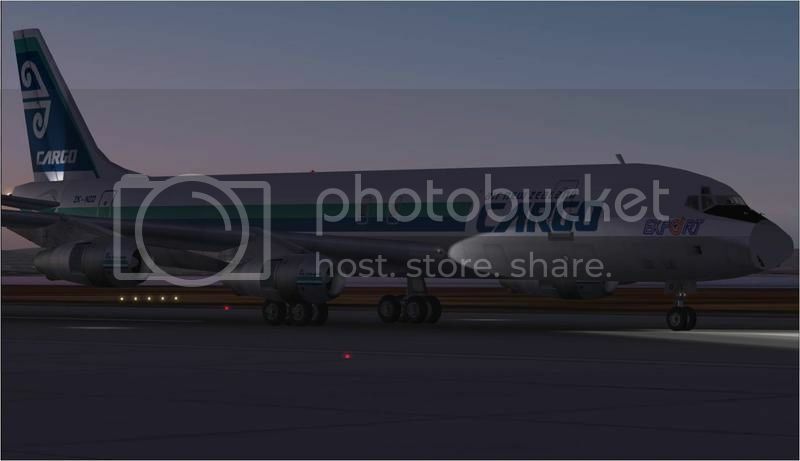 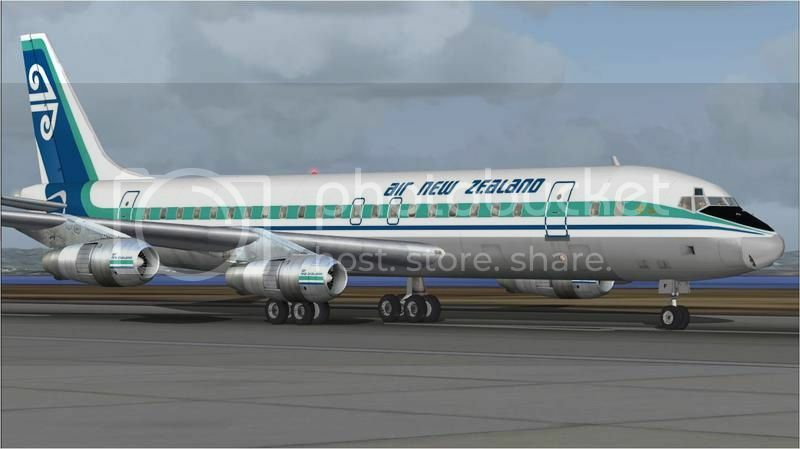 HJG have just released its "new, updated, improved, and "very authentic" flight line of AIR NEW ZEALAND DC-8-52 and -54F textures .... featuring each of the major livery variations/adjustments applied to these aircraft between 1965 when the first aircraft was delivered and 1986 when the last of the type was withdrawn from service. 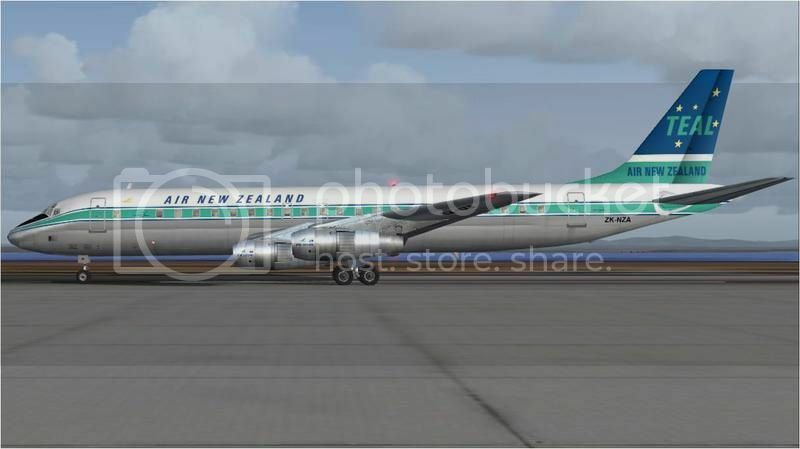 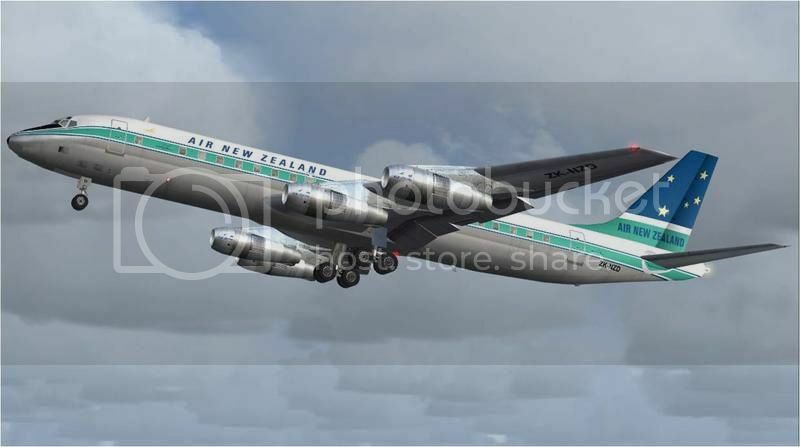 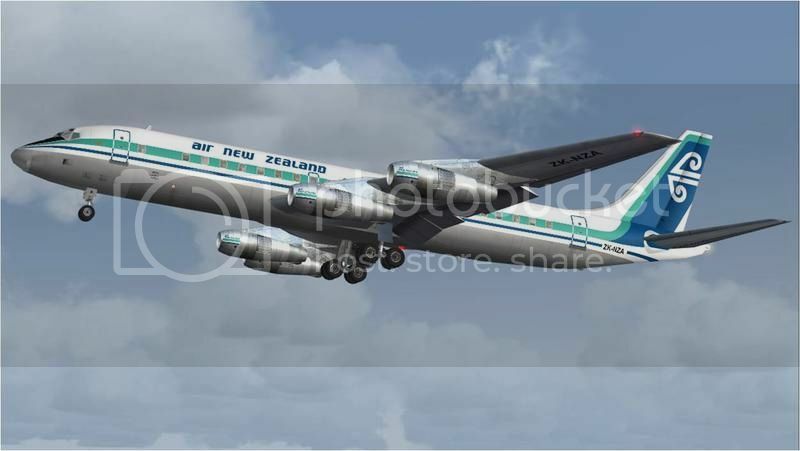 ZK-NZA TEAL/AIR NEW ZEALAND delivery scheme 1965. 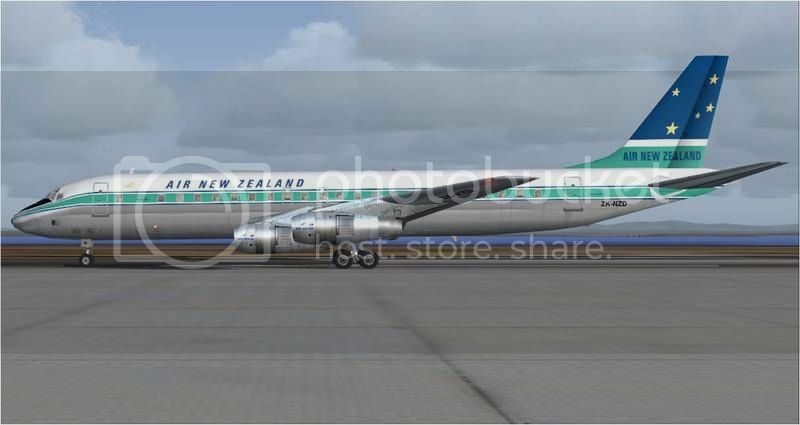 ZK-NZB TEAL/AIR NEW ZEALAND experimental (white stars) scheme 1965 .... this experimental livery was applied to this particular aircraft only aand supported for just a few months during 1965. 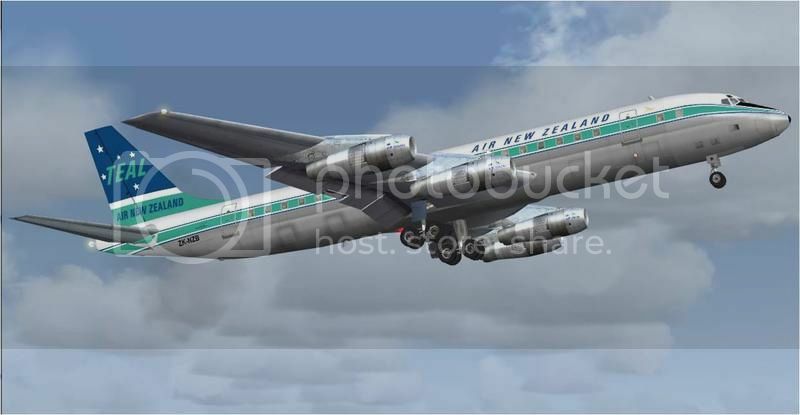 ZK-NZD AIR NEW ZEALAND definitive 1966 scheme. 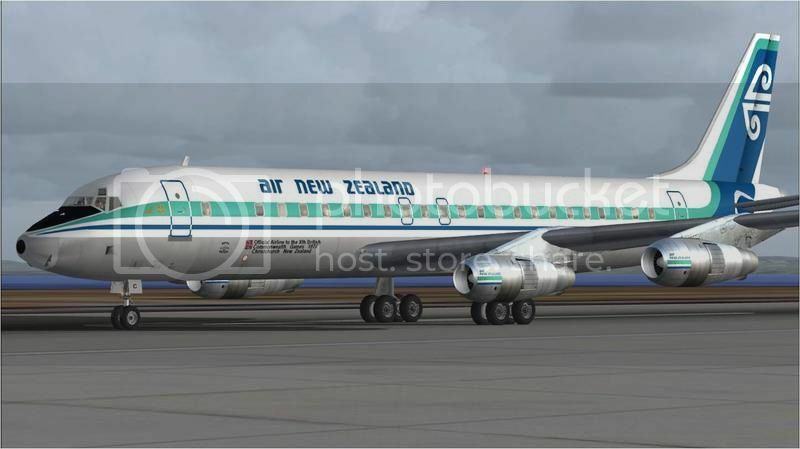 ZK-NZA AIR NEW ZEALAND early 1970´s hybrid scheme .... with pre 1974 commonwealth games legend .... "Official Carier To The XTH British Commonwealth Games Christchurch New Zealand". 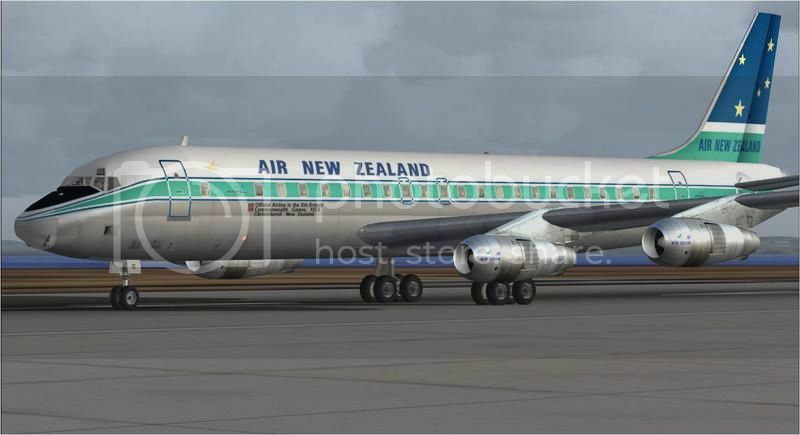 ZK-NZD AIR NEW ZEALAND 1973 hybrid scheme .... with pre 1974 commonwealth games legend .... "Official Carier To The XTH British Commonwealth Games Christchurch New Zealand". 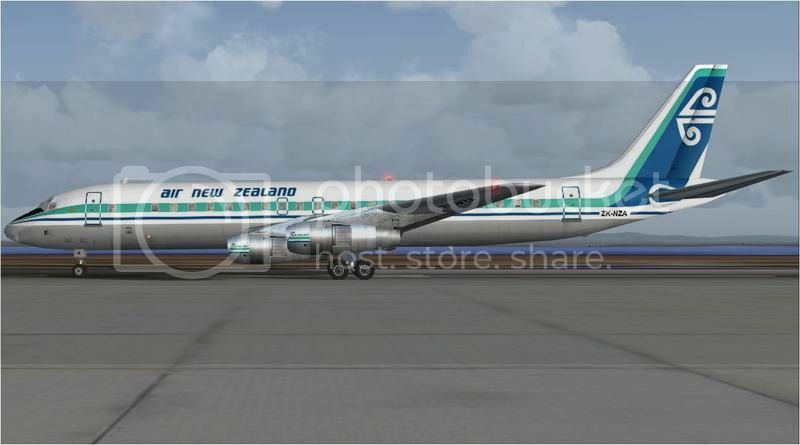 ZK-NZE AIR NEW ZEALAND early 1970´s hybrid scheme .... with 1974 commonwealth games legend .... "Official Carier To The XTH British Commonwealth Games Christchurch New Zealand" and "NZ74" logo. 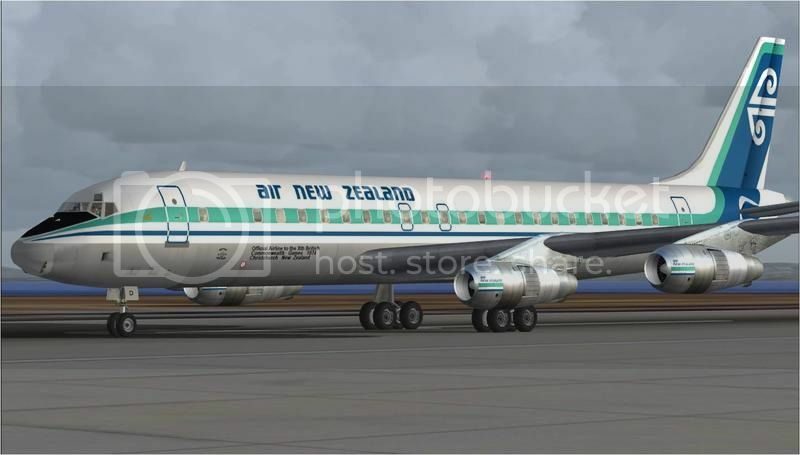 ZK-NZC AIR NEW ZEALAND 1973 hybrid scheme .... with 1974 commonwealth games legend .... "Official Carier To The XTH British Commonwealth Games Christchurch New Zealand" and "NZ74" logo. 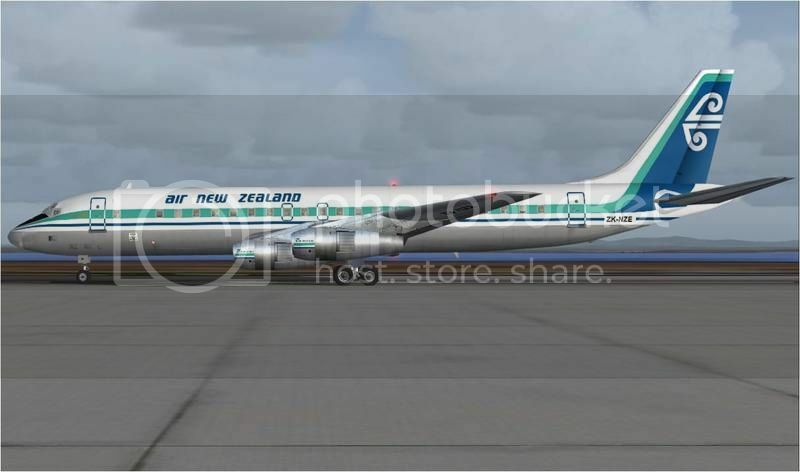 ZK-NZA AIR NEW ZEALAND definitive 1973 Scheme. 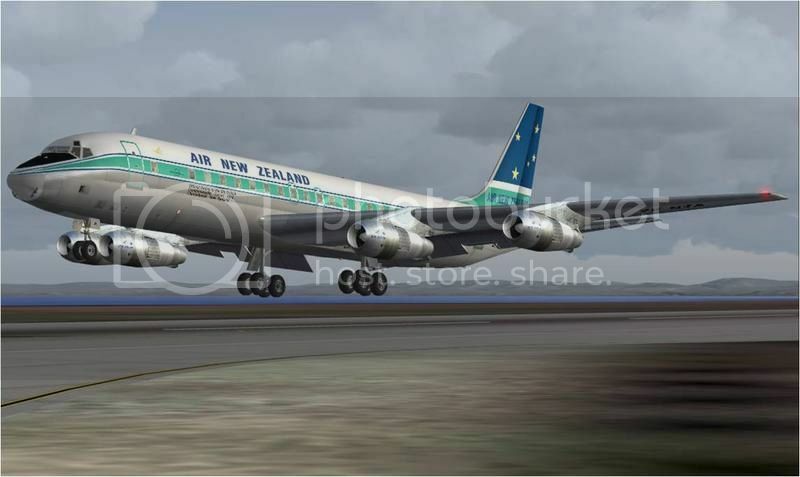 PLEASE NOTE: Both 1960´s based and 1973 introduced liveries were supported by AIR NEW ZEALAND DC-8´s during this transitional period. 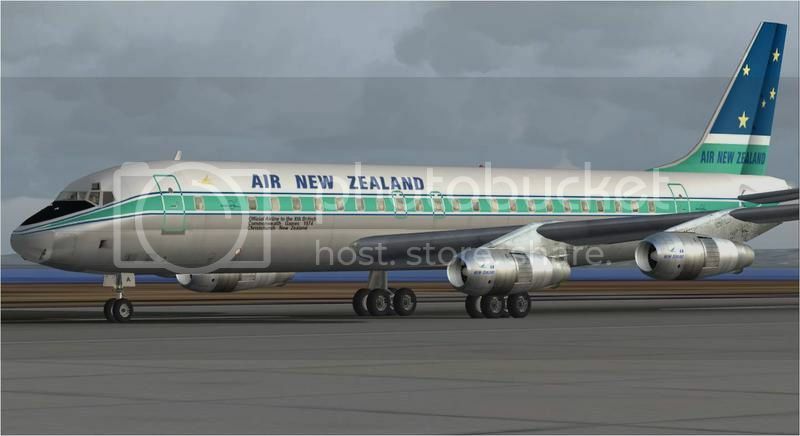 ZK-NZF AIR NEW ZEALAND/NZNAC 1977 post merger scheme .... both Maroro and Godwit logos on forward fuselage stripe. 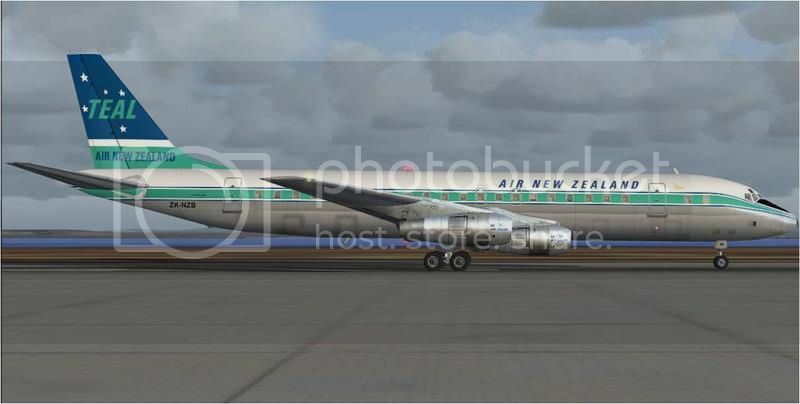 ZK-NZE AIR NEW ZEALAND 1980 .... temporary blue rudder experiment. 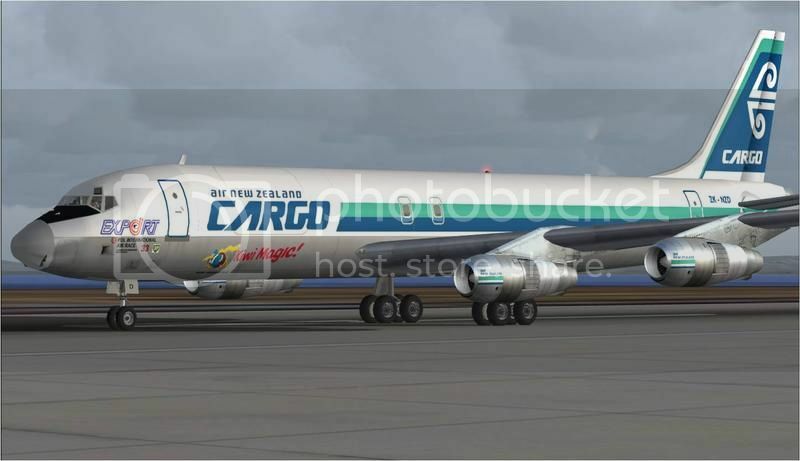 ZK-NZD AIR NEW ZEALAND CARGO redelivery scheme 1981. 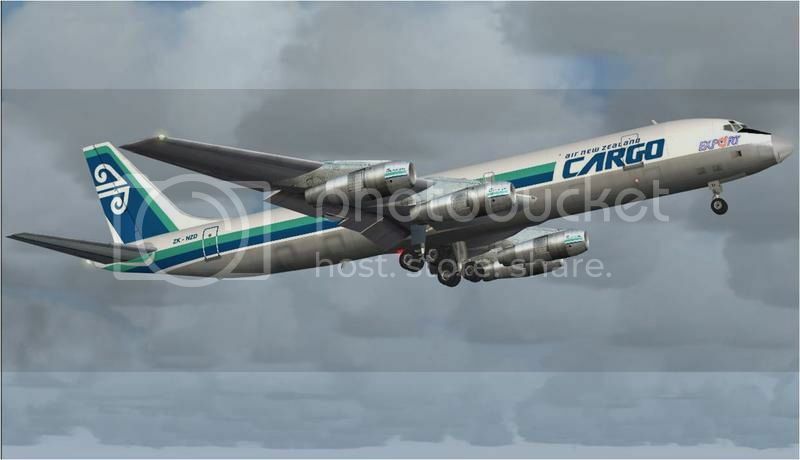 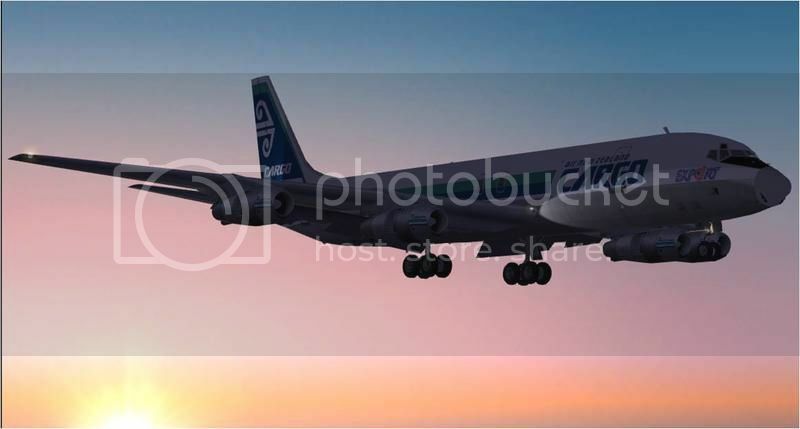 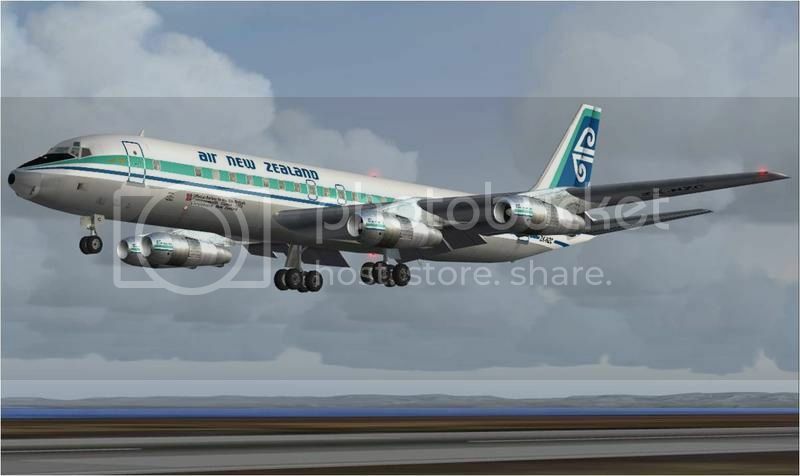 ZK-NZD AIR NEW ZEALAND CARGO definitve 1983 scheme. 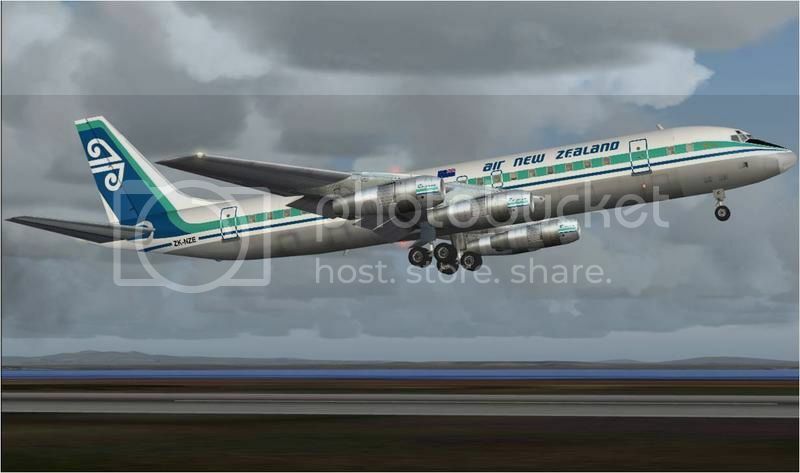 ZK-NZD AIR NEW ZEALAND CARGO 1986 Singapore/Christchurch PDL Air Race" hybrid scheme. 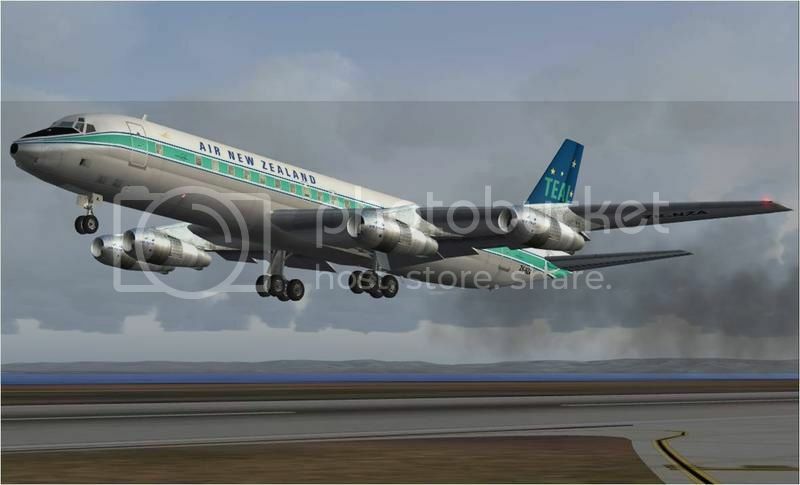 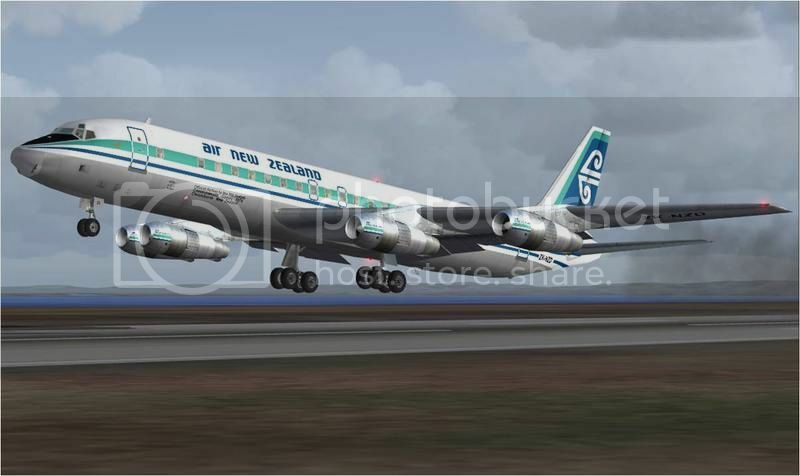 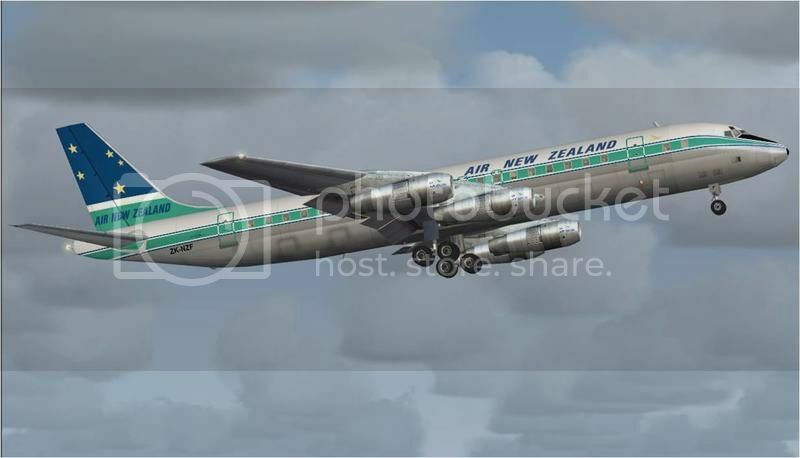 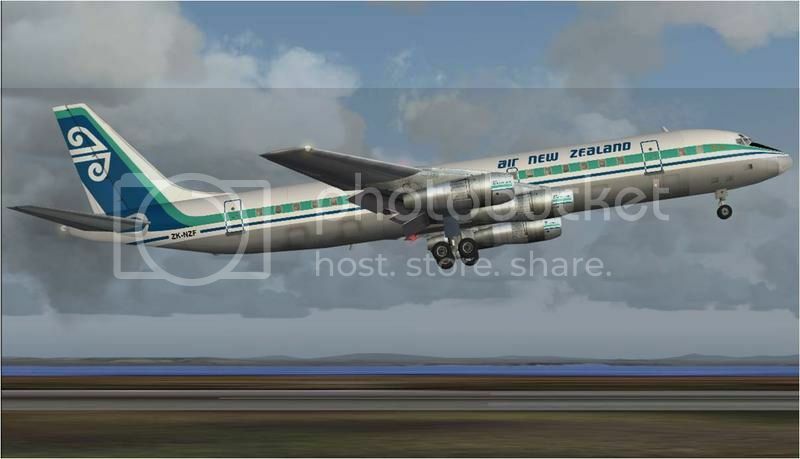 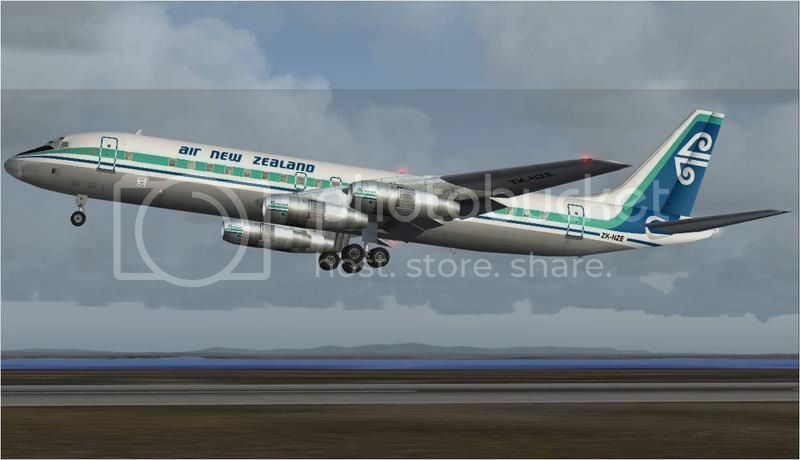 PLEASE NOTE: The texture featured within the above video relates to the "old/original" AIR NEW ZEALAND 1973 DC-8-52 textures which has been replaced with the latest "new, updated, improved, and very authentic versions just released. 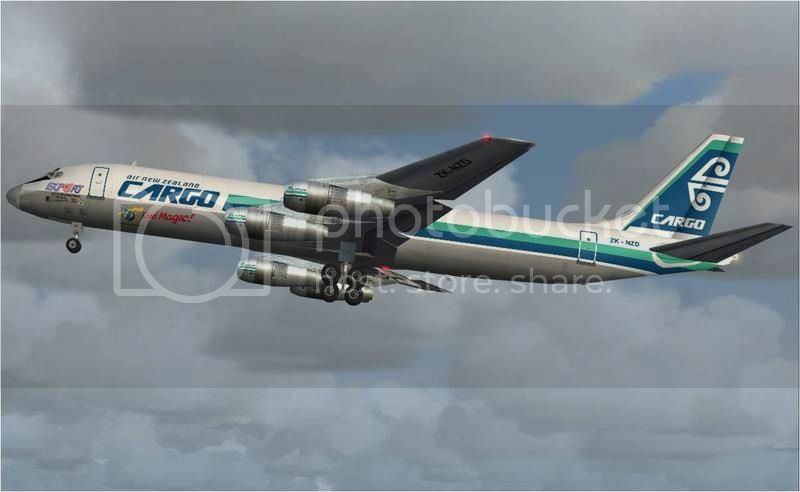 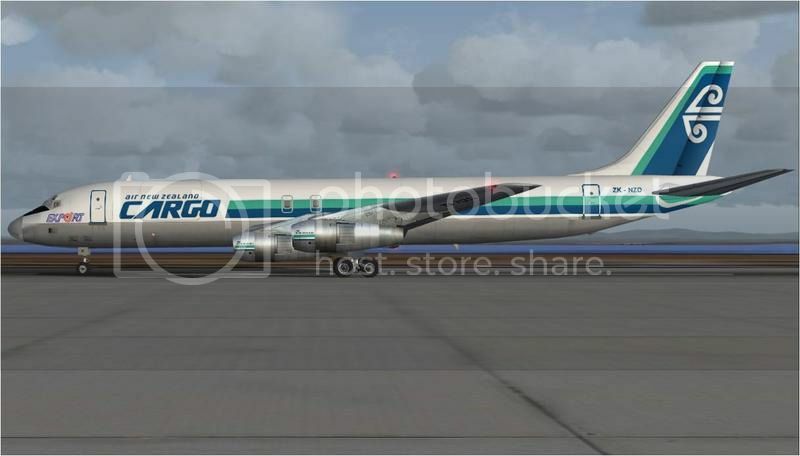 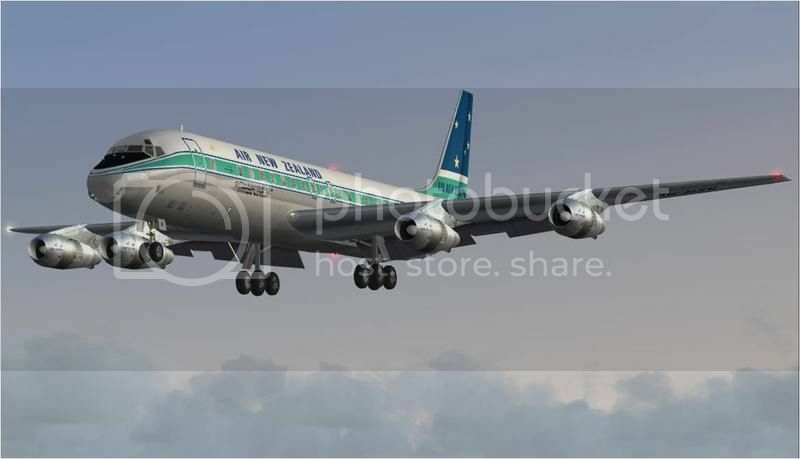 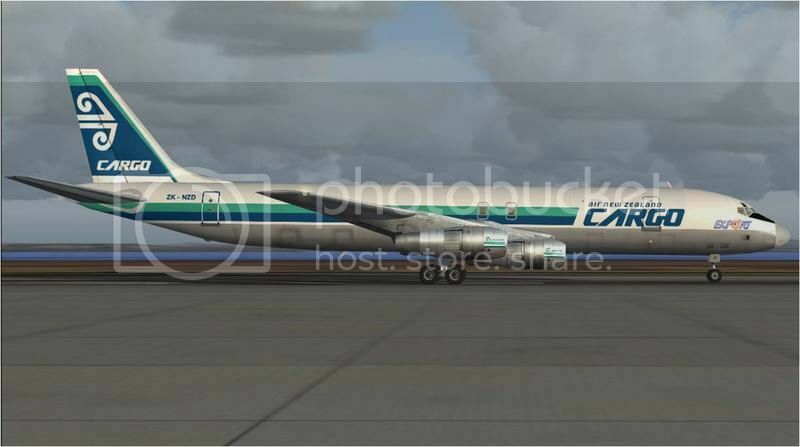 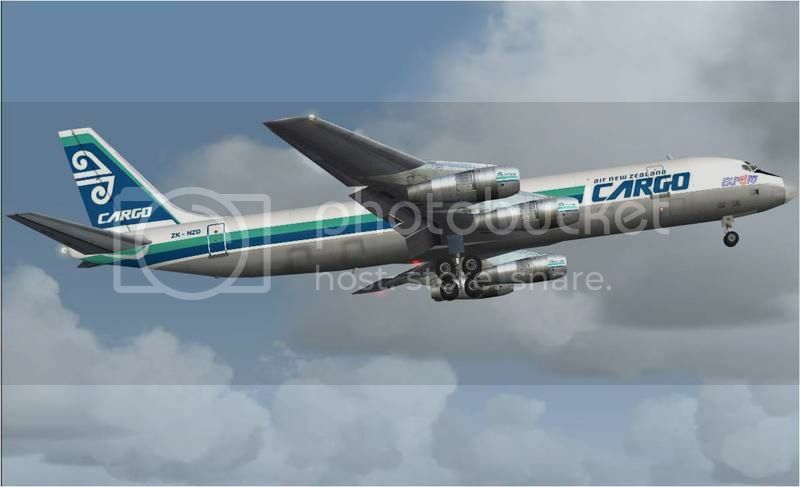 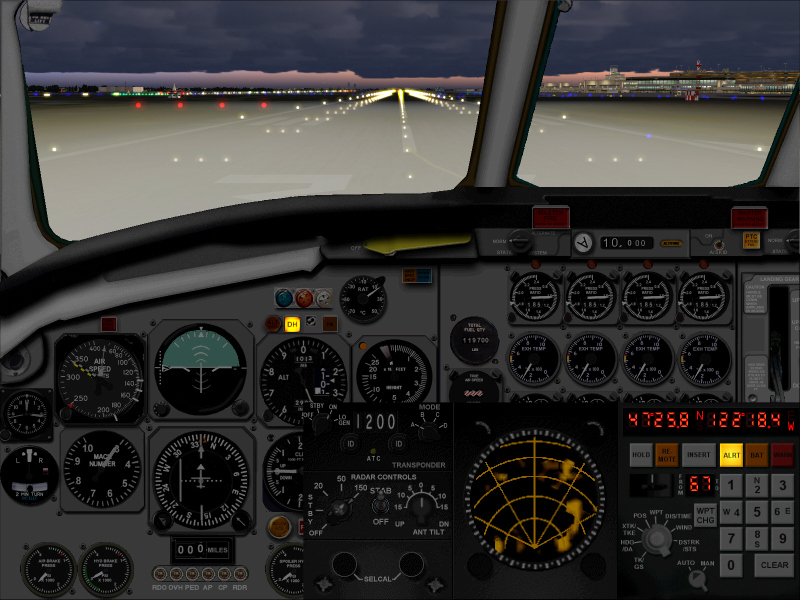 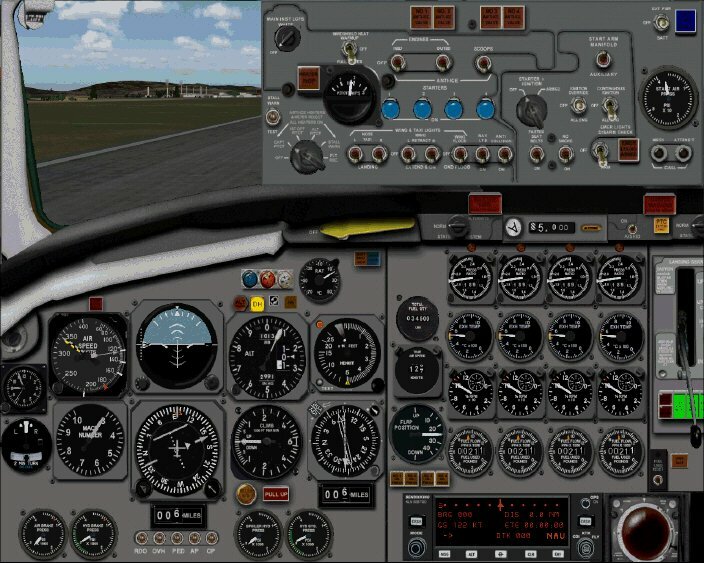 All HJG supplied DC-8 aircraft base packs, effects, FDE, models, panels/gauges, sounds, and textures are both "FS2004" and "FSX" compatible/portable only.